When Ballard entered Starfleet Academy, she became close friends with Harry Kim, who lived across the hall in their student dorm. She taught him to ice skate, despite his dislike for cold weather. During her Academy years, she never knew that Kim had a crush on her, and that being in the same classes as him was not a coincidence. Her favorite things to eat were peanut butter and jelly sandwiches; during dinner with Captain Kathryn Janeway she mentioned that she used to live on them during her Academy years. Her sloppiness sometimes caused Kim to ask for a baryon sweep of his room. In 2371, Ballard graduated from Starfleet Academy as an ensign and was posted to the newly-commissioned USS Voyager under the command of Captain Janeway. Her primary post was in main engineering. 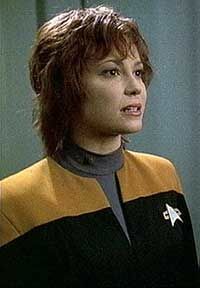 In 2373 she was on Voyager when it used an artificial wormhole to slide into another quantum reality. After Vorik's promotion and reassignment Lyndsay was named Assistant Chief Engineer.